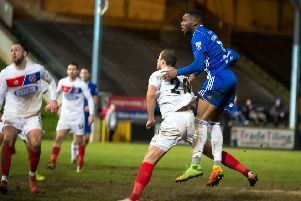 Set-pieces could be FC Halifax Town’s best route to goal on Saturday when they host bottom-club Dover (3pm), according to Josh Fordham, sports reporter for Kent Online. Dover are the National League’s basement-dwellers having won only two of their 19 games so far this season in the division. They sacked previous boss Chris Kinnear after more than five years in the job, with him winning just once in 14 league matches. His successor Andy Hessenthaler, who left fellow National League side Eastleigh to take up the post, has garnered four points from his first four league games, but lost 5-0 at Bury in the FA Cup last time out. Mitch Brundle and Kevin Lokko lead the way for Dover with four goals each this campaign. Dover are the only side in the division without an away win, while only two sides have conceded more away goals than them, and only Maidenhead have a worse defensive record in the league. But they have recorded some good away draws at Bromley, Sutton, Chesterfield and Harrogate. “It has been a tough season for Dover,” said Fordham. “Things have improved slightly over the last couple of games but they need points desperately if they have any hope of staying up. “The win against Maidenhead in their last league game was the best performance of the season so fans are hoping they’ve turned the corner. Fordham thinks Dover would take a point on Saturday. “Three points is really what they need but a point is still a step in the right direction,” he said. “Things have started to improve under Andy Hessenthaler. He’s shaken things up at the club since joining. They’ve moved to full time training and brought in a raft of players with lots heading towards the door. But Fordham reckons loanee Bobby-Joe Taylor is Dover’s dangerman. “He’s only on loan from Bromley for a month but has been controlling the game for Dover in the last couple of league matches. Fordham says Hessenthaler has injected more of a passing game into the side since replacing Kinnear, who played more of a route-one style. Fordham says Dover are likely to deploy a 3-4-3 system, but that striker Tobi Sho-Silva will miss the game through injury, as will defender Tim Schmoll.